Conversations about the black family in the United States usually focus on the roles of single mothers and absent fathers; at times, completely ignoring the direct product of these relationships- the children. But as we move forward in our conversation, more attention should be directed to the children. No need to go into a long statistical explanation, but it is necessary to mention that according to the 2008 U.S. Census, 8 out of 10 black babies were born out of wedlock. Now that this statistic is out the way, the greater question the community should be asking is, “What are the reasons children who are products of single parenthood are more likely to have lower self-esteem, commit suicide, become criminals and drop out of high school?” Taking these effects into consideration, black men and black women must be mindful of how children are affected when the parents are not in stable, healthy marriages. This is not a condemnation of single motherhood rather a closer analysis on the familial structure and how it innately affects children. Some single mothers might argue that they provide all of their children's needs, even overcompensating-which is counterproductive most times, because these children can develop entitlement issues and lack of responsibility. It is clinically proven that fathers provide protection and shape our identities. Two very important factors missing in the majority of black children's lives growing up right now in the United States. To understand the effects a child growing up in single parenthood experiences, one has to analyze it from the psychological standpoint. What are these children thinking about their familial situations and their self-worth. Children develop their first feelings of belonging and worth from their parents from whom they are a direct extension. When part of that extension is missing a feeling of void and abandonment develops which is clinically proven as the cause of behavioral and psychological issues. Think about it this way- how many more men would know discipline, respect and right from wrong if their father was present to teach and show them. Little girls get their self-worth from their fathers whom they use as a role model for the type of mate to choose. But in the cases of single mother homes, these children are lacking the important essentials that assist in socializing them. Children need to see their fathers at their sports tournaments and plays. They need to see that daddy loves them and supports them in this brutal world. "I feel so bad. I'd rather have a dead father than a father that's living who has nothing to do with me", is one of the most gripping statements Cynthia Grace, P.H.D, participant in the documentary ON MY OWN, remembers that one of her patients said to her. Dr. Grace also talks about feelings of abandonment, anger and hurt felt by many children living in single parent homes. The conversation needs to shift from one of condemnation of parents to the advocacy of raising healthy, comforted children. The bottom line is this, as our community continues to date, there should be more serious conversations placed on family values, more thought placed on responsibility, and more emotion put into dating and engaging in sexual relations. Black males and females intimate interaction is bigger than sexual gratification. Children, in many instances, are produced from these interactions. Relationships must be in tact because children need both parents. Our children's psychological well-being is desperately important to the Black community. 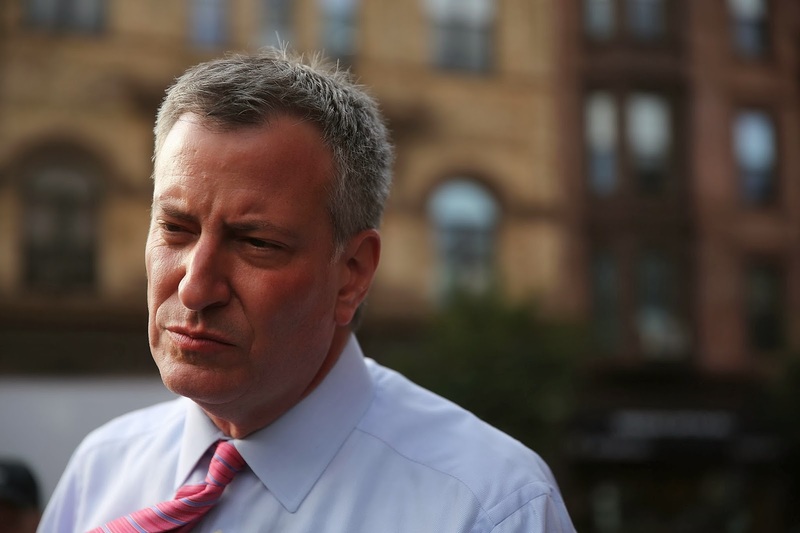 During newly-elected Mayor +Bill de Blasio January 17, 2014 speech on the proposed changes to the paid sick leave policy he stated that, "1 out of 4 families in New York City shelters have at least one working parent." While campaigning last fall he referenced Charles Dickens' 1959 novel, A Tale of Two Cities, saying New York City is the quintessential example of extreme economic disparity. Currently, New York City consists of two types of residents, the haves and have-nots. For de Blasio to accomplish his goals for the city, he will have to make rebuilding the family structure, especially those in urban communities, a top priority. Families need a lot of support and assistance in New York City. Economic security is a mere dream to many New Yorkers. While this new sick leave policy will help, there is a long way to go in stabilizing urban families. According to Citydata.com, a family of four in New York City would need to earn between $91, 465 and $211, 645 for a moderate living. One can comfortably speculate that the average bureaucrat or private sector worker isn’t even making half of these numbers aforementioned. Families are slipping further into debt and poverty, losing the fight to maintain a decent lifestyle. The city also has one of the highest costs of living in the country, in the world for that matter, making it difficult for working parents, in a stagnant wage city, to live comfortably and escape poverty. Under these circumstances, some families have left New York altogether seeking more affordable living in other states. This city is in jeopardy of fully dismantling the family structures in urban communities, which will result in an even more devastating downward spiral for the communities these families reside in. Adding to the city’s familial dilemma is the single parenthood factor. Thirty six percent of single parents live in New York City according to the +Annie E. Casey Foundation , many falling below the poverty level. It is a tough task that the mayor needs to embark on but he really has no choice. A +New York Times article recently highlighted that 31% percent of children 17 and younger have fell below the poverty line, indicating that poor and working class parents, especially in these urban areas, are having a very difficult time making ends meet. Job training programs should solely target the working poor and unemployed to provide them skills to rise into the working class. De-blasio will also have to continue to fight for public assistance programs: food stamp, WIC, and Medicaid, increase funding for qualifying working parents and simplify the requirements to qualify for such programs. Continuing on with former Mayor Bloomberg’s Young Mens Initiative, to prevent young boys from premature fatherhood or help in preparing them for pending fatherhood is also productive. Childcare, another major factor and complaint for working parents, must seriously and urgently be addressed. Working on more quality government child care facilities and providing more subsidies for working parents making under $120,000 combined will financially relieve a lot of the burden and gives these parents extra finances to save or be spent elsewhere. De Blasio can also support lobbyist who advocate for increasing the minimum wage. It is more pertinent in costly cities like New York City for families to live comfortably. New York City’s working parents living in lower socioeconomic areas shouldn’t have to fear how they are going to house, feed, clothe and properly educate their children. This is an injustice to responsible parents who work hard and honestly to provide for their children. Why should working parents constantly struggle to keep their heads above water while more affluent parents can effortlessly provide their children with the best housing, education and culture that the city has to offer? For this city to truly be on its path of living equality targeting families and their well being is the best way to go. Having a family, for most human beings is inevitable, even in New York City. This great city has succeeded because of individuals that have started families here, invested in communities and helped to uplift New York to its great worldly status. The Dwayne Wade-Gabrielle Union scandal involving Wade fathering a child outside his committed relationship with Union has sparked interesting conversations among African American women. In the comment sections of many blogs, several black women have expressed their disgust at Wade's, and all black men's infidelity, as well as their conscious decision to live permanently along. Some have proudly stated that they are in their late 30s and early 40s and have never been married or had children. They mark this as success along with career and financial accomplishments, boasting that they have accomplished their heart's desire. The blog comments observed made by these black women specifically in regards to professing these accomplishments, true or not, don’t coincide with the study released by the Insight Center for Community Economic Development. The study found that single women of color, between the ages of 36 to 49, have a net worth of $5. It also showed that Black and Hispanic women are drastically worse off than white women who have higher marriage rates. Ironically, studies show that black men benefit highly from marriage. Discussing why marriage is important to black existence includes the message that relationships should be based on a loving and healthy premise. Dating black men and black women must understand that relationships aren’t just based on instant feeling and 100% happiness but is also based on love- that will sometime during the marriage require sacrifice, struggle and forgiveness-a lesson maybe Gabrielle Union understands. That is just the reality of being in long-term relationships that all races and ethnic groups experience. There are highs and lows. Black relationships in many instances are complex and strained stemming from an unstable premise during slavery, which has continued without being fully being addressed. There could be a subconscious disdain between the genders. Supporting this are the recent studies that have shown that black men and black women wait the longest to get married. A detrimental move that prevents or severely extends wealth building, acquired faster, when two people are working together. Communities strive on healthy families that bring culture, diversity and a source of income to build, maintain and progress the neighborhood. Western society spreads individualism ideology- “what’s mine is mine”. However, socially, the individualistic approach could never work for African Americans who endure disenfranchisement causing higher poverty rates. Most ethnic groups and Caucasians themselves understand that progress can only be made when working as a group. Our communities, plagued with single mothers, display from the higher crime rates, decaying infrastructure and poverty that “I can do it by myself” mentality is a falsehood that black people just can’t afford to adopt. You could read through the words the anger, unhappiness and disappointment of these commenters, specifically the women, masked in boasting individualism and singledom. These women and men must realize that life is volatile and a partner is needed to assist in buffering the harsh realities of it. The black community must aggressively encourage and push the marriage agenda, the familial aspect of solidarity. From there, our communities, personal wealth, and social positioning will accelerate.